I am a pretty big proponent for many of DevDemon’s addons. But without a doubt, Channel Images is at the top of the list. The ease of use for me as the developer and the for the client is immeasurable and well worth the cost of the addon. As fantastic as the plugin is, there are a few downfalls, Like trying to get data into Channel Forms. The one that faced me this week was bulk importing images to the Channel Images field. 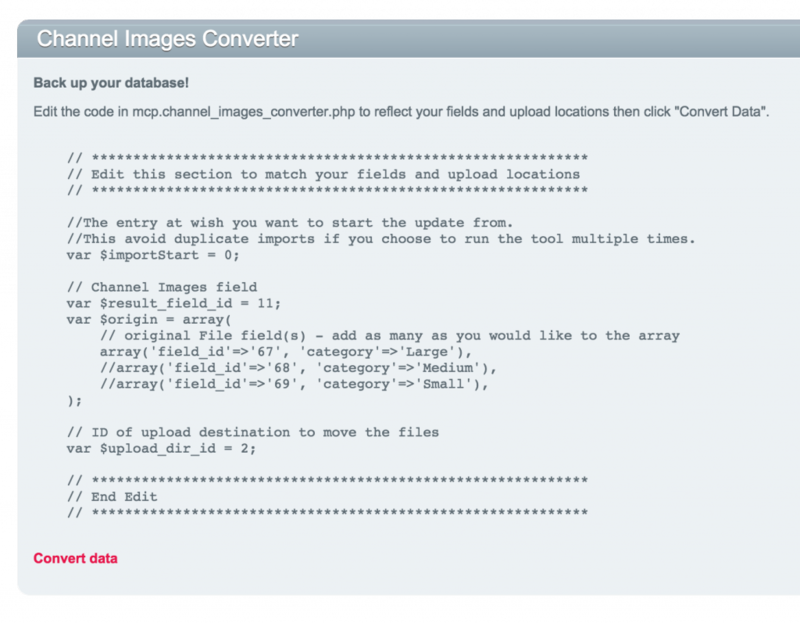 As of this post, this is not a default functionality in Channel Images or any of the importer plugins available. After some research I was able to find a plugin that Yuri Salimovskiy of IntoEEtive posted in replies on a forum that would take native File field attachments and import them into Channel Images. So I quickly downloaded the plugin, backed up my database, then ran the plugin. I activated the “Channel Images Converter” and I crossed my fingers. I shot a quick message over to Yuri to see if there was an updated version available, however there wasn’t, but he did give me a few pointers and a few messages later I was able to update the addon to be compatible with ExpressionEngine 2.9.2. Along with the compatibility update – I also added a some documentation and a the ability to start the import from an entry. This little feature allows me to do multiple imports without re-importing and duplicating images in the Channel Form field. Re-generate images with Channel Images. Although this is not a perfect solution, it is still much better than doing thousands of entries by hand. Hopefully sometime in the near future DevDemon or importers such as DataGrab will enable this feature in their Add-ons. This entry was posted in Code on August 6, 2015 by Mike McBrien.